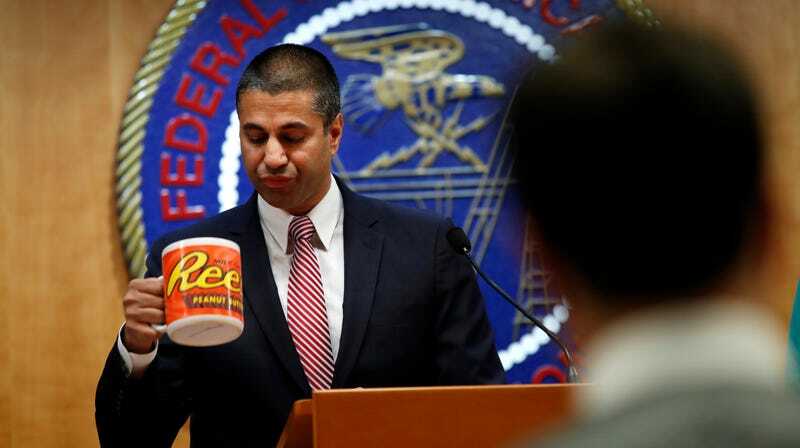 After a meeting voting to end net neutrality, Federal Communications Commission (FCC) Chairman Ajit Pai, takes a sip from his comically over-sized mug while answering questions from the media. Last week, the FCC was forced to admit in court that its Electronic Comment Filing System (ECFS) was never designed to keep track of where comments originate. Not only is the system not designed to prevent fraud or the use of bots, it said, when incidents of identity theft are widely reported, the system is not equipped to determine who’s responsible. In response to allegations that millions of comments submitted to the FCC about net neutrality in 2017 were fabricated—using the names and home addresses of Americans without their consent—the New York Times is actively seeking access to the FCC’s internal logs under the Freedom of Information Act. Its reporters have specifically asked the FCC to turn over records that contain every comment and the IP addresses from which they originated. But the commission is fighting back. For starters, the FCC is denying the Times access to these records on privacy grounds: releasing the IP addresses, it says, would “constitute a clearly unwarranted invasion of personal privacy.” It further alleges that releasing the logs would compromise the security of the ECFS, which is essentially a crime scene at this point thanks to concurrent state and federal investigations. The notion that the system is in any way “secure” to begin with is comical, since one doesn’t need to actually commit a computer crime to flood it with bogus comments. If one were to email the agency and ask for instructions on how to submit comments in large batches, not only will it gladly provide that information, it will load them into the system regardless of whether they’re real or not. Comments attributed to Americans who have been saying for over a year that their identities were stolen can still be found on the FCC’s website, right next to political (and in some cases veiled anti-Semitic) remarks that they did not write. The process of figuring out where particular comments originate, in the FCC’s own words, is complete guesswork. The system is not designed to prevent fraud, and if fraud does occur, it is not designed to detect it, nor produce evidence of who is culpable. Americans should not have to worry about whether malicious political statements, which they did not write and do not stand by, are being published by their own government in their name, without their consent. To a certain extent, Gizmodo can confirm that what the FCC is saying is true. Last month, we reviewed some of the logs sought after by the Times, disclosed in a separate lawsuit by a different agency. Gizmodo reported on multiple sources of fraudulent comments in two articles this year. Each required a considerable amount of time and legwork. The FCC’s argument that it can’t release the logs on the basis of privacy is undercut by the fact that the General Services Administration, which manages the API system used by the FCC, already released them—or at least part of them. The API system is only one of three ways comments are submitted; the Times is seeking access to logs related to the other methods as well. The API logs, which Gizmodo has reviewed—and the New York Times and Wall Street Journal both have access to now—do include at least dozens of IP addresses belonging to groups that uploaded millions of comments combined. FCC memorandum of law in support of its motion for summary judgement, March 3, 2019. New York Times v. FCC. On a technical level, the issue is that the logs of when comments are submitted do not actually contain the comments themselves; they merely track when comments were uploaded and by whom. To track an individual comment back to its source, investigators have had to compare the timestamps on the comments to the logs identifying the uploaders. But timestamps on the comments and the logs do not match perfectly, likely due to server latency. The timestamps are on average off by a few hundred milliseconds (two seconds at most), indeed making it difficult to confidently ID the source of a fake comment, based on our experience. Going forward, Americans should not have to worry about whether malicious political statements, which they did not write and do not stand by, are being published by their own government, in their name, without their consent. And at the very least, when and if this type of crime does occur, it should be the FCC’s responsibility to ensure that it’s technologically possible to figure out who the culprits are. If not, its notice-and-comment rulemaking is finished and this is all just administrative theater. Correction: The original version of this article stated that FCC’s API logs contained “thousands” of IP addresses. While there are thousands of records, the logs contain only dozens of unique IPs. We regret the error.